If you have set up domain groups on your own reseller account these will by default be under the wholesale model, where the customer does not have access to their configuration (they cannot access your reseller account) and where we invoice you for the domains. If this was a mistake, if you have changed your mind about what model you would like to use or if you simply wanted to set up everything for the customer before inviting them, then you can invite your customer to take ownership of that domain group where the customer’s domain(s) is. The customer will gain access and will also accept that the invoice is coming from us (retail model). Please note that if you invite a customer to take ownership of a domain group, then it will be for the entire domain group. Therefore, please make sure that you do not have any other domains that don’t belong to the customer in that particular domain group! Please note that if you would like a customer to take over a domain group you have already created on your reseller account, then you must use this method. If you simply invite the customer from the 'Customers' menu point - by making use of your unique reseller ID or the 'invite new customer' button - then the customer will be invited to make a general Cookiebot account that is linked to you as a reseller - but it is not linked to the particular domain group you wanted the customer to take over. If the customer has not yet accepted your invitation ('pending' on the list under 'Customers') then just tell the customer to ignore your invite and send him a new one using the method above. If your customer has already accepted your invitation ('active' on the list under 'Customers') then instruct the customer to delete his account (make sure he has not added anything else on that account since all data will be lost). This can be done in the following way: How do I cancel my subscription? (cancel the account completely). Send an invitation using the method described above. The customer may need to wait 5-10 minutes before he can accept the new invitation (the system needs to reset his email so it can be used for a new account). 2. 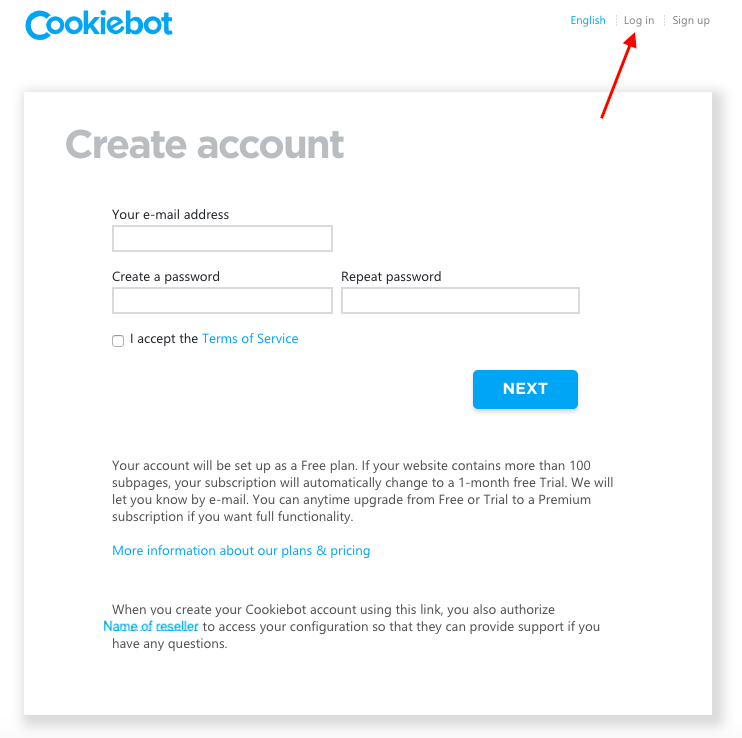 Important: Make sure to be logged out of all Cookiebot accounts in all browser windows before continuing. 3. The link in the email is normally for creating a new Cookiebot account that will be automatically added to your reseller account. However, you should instruct the customer to enter the link in his browser but rather than create a new account, he should log in using his existing account info. It is very important that the customer does NOT just enter his information. He has to FIRST click 'Log in'. Otherwise it will not work. 4. The domain group should then be transferred to the customer’s account. As a reseller you will have access to the account - and the domain group - via the 'Customers' menu point on your reseller account.